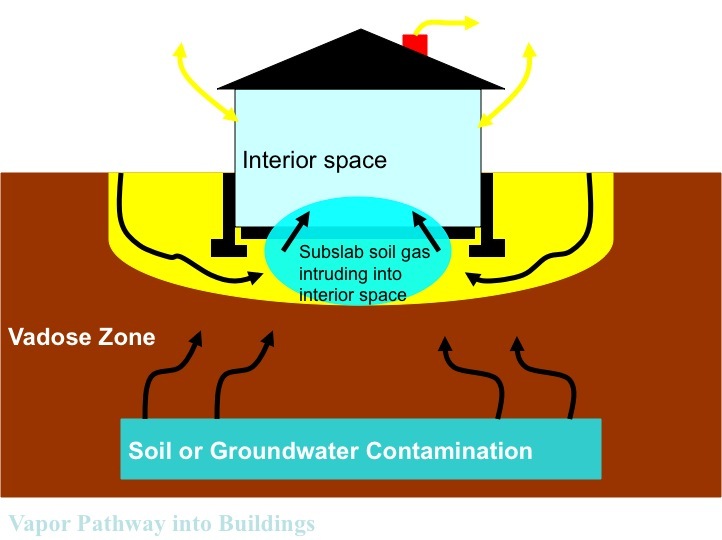 A simple comparison of how DEP responds to public health risks associated with exposure to indoor radon gas with how they address similar – or greater – public risks associated with chemically contaminated indoor air is instructive. It basically tells you all you need to know about DEP’s behavior – and how the chemical industry influences that behavior. Radon is a naturally occurring gas. 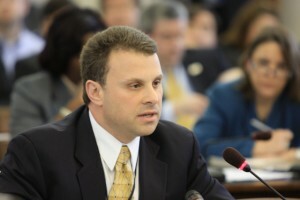 Chemicals are manufactured by powerful NJ industries. Both cause cancer. Both poison the air in thousands of NJ homes, schools, and buildings. The “exposure pathway” via vapor intrusion into buildings, the associated human exposure potential, and mitigation systems are very similar. But those risks are managed very differently. To state the obvious: it’s a lot easier – politically – to target a radon bearing rock as a health problem than a chemical factory. 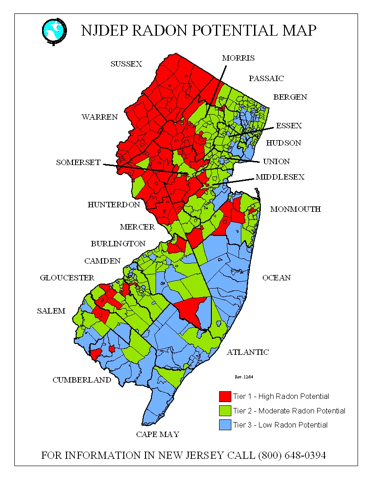 Radon Risk Map – Where is the map for Chemical Risks? To manage indoor air radon risks, DEP: 1) issues press releases and fact sheets, 2) widely distributes health advisories that unequivocally state that radon causes lung cancer and warns the public about how to avoid cancer risks; 3) provides maps that target areas of high risk; 4) mandates monitoring of schools and day care centers; 5) provides clear guidance to homeowners and urges them to test indoor air and install mitigation systems to reduce those risks; and 6) provides scientific and staff resources to manage a statewide program . To manage indoor air chemicals risk, DEP does virtually nothing. Instead of immediately testing indoor air, the DEP “Vapor Intrusion Guidance” document outlines a lengthy voluntary 10 stage process than may take years to complete and isolate the public. The document is riddled with loopholes and “exit ramps” expressly designed to let polluters off the hook and blame other sources, like household products. Worse, they make it HARD for the public to find out about those risks. Even worse, they provide loads of loopholes to the polluters to avoid cleaning up the problems and otherwise incurring legal liability for those risks. The explanation for the difference is simple: Radon is naturally occurring. Nature, the cause of radon, doesn’t have the chemical industry’s legions of lawyers, lobbyists,and PR hacks to pay off and/or silence state officials and intimidate scientists. This is totally unacceptable and must change. More to follow on this – but where are our intrepid press corps? Need to bring back Daryl Isherwood, formerly of the Trenton Times – he wrote great stories, like this vapor intrusion epissode in Hopewell Borough. 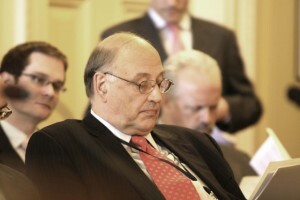 I spoke – twice – at Town meetings and was told to shut up by Mayor Knights, who had the gall to accuse me (not Rockwell International, the corporate polluter) of creating another Love Canal in his lovely Borough! Many community leaders were more concerned with the Borough’s image and property values than their own health. This was the same local government crew that approved development permits at Kings Path, right on top of the Rockwell plume that showed 400,000 ug/L! TCE levels. These are important reason why strong state standards and enforcement are warranted – the liability and economic pressures to deny the problem are great at the local level. Hostile Takeover of DEP Science – Industry Seeks to Stack Board with Cronies Parents Want to Know: Why the News Blackout of This Story?